I have used a T.E.N.S. machine many times under the guidance of various therapists. 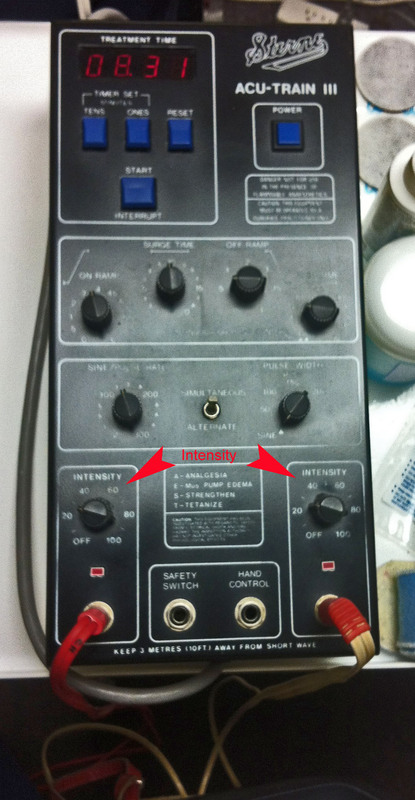 For those unfamiliar with this treatment, mild electric current flows to pads secured to the patient’s skin. It causes muscles to contract. Dr. Ho’s Pain Therapy System seen on infomercials is a T.E.N.S. machine. Here is one of the machines that I use on a regular basis. At the bottom are two dials for “intensity.” There are two intensity dials because the machine regulates the left and right pads separately. Comfort levels change between individuals. They also change from moment to moment for the same person. Intensity levels vary from one area of the body to another, hence the two dials. There is no “consistent” setting. If you asked a patient using a T.E.N.S. “Are you okay?” the answer should be “Yes.” Discomfort results in a reduction in intensity. If asked, “Do you want me to turn it off?” the answer should be, “No.” Stimulation should be neutral or pleasant. With shock collars, it is this underlying premise that is fundamentally different. Bark collars shock dogs to suppress barking. Barking reduces because the dog does not like the shock. If the shock were neutral, nothing would change. If it were pleasurable like a T.E.N.S. machine, barking would increase. Barking would increase because the dog would be learning that barking leads to massages. The same goes for electronic training collars used as negative reinforcement. Negative reinforcement is like the game “Uncle.” Children pinch one another. They keep pinching until the other child says, “Uncle.” The behaviour of saying uncle leads to cessation of pinching or relief. Similarly, dogs turn the shock off by obeying a command. Reinforcement is the cessation of the electronic stimulation – relief. Dogs that respond quickly can “beat the buzzer”, avoiding shock altogether. “Pleasant” shock, under the level of aversiveness wouldn’t be effective here either. Ask a dog, “Do you want the electrical current to stop?” The answer needs to be, “yes” or the collar will not work as designed. Both may involve electrical current but the intensity is on a gradient. Many things are on gradients. Music is nice, unless it is too loud. Massage feels good, unless Olga the Horrible is hurting you. (My apologies to anyone named Olga. Olga was the name of the massage therapist who hurt me.) Light helps us see unless it is glaring. Flowers smell pretty unless it is an overdose of noxious perfume. Cool water makes a refreshing swim. Cold water is icy and painful. Food is usually fabulous, unless you have eaten excessively and feel nauseated. No one thing fits neatly into a naughty or nice category. Dogs decide what they find pleasant, neutral and aversive. We infer how the dog feels by observing their change in behaviour. I would have gladly paid Olga the Horrible to stop the massage. Massage therapist Mike was different. He had magic hands. I would pay money for longer massages. Olga’s massages were aversive. Brad’s were appetitive. I was not screaming and thrashing in pain with Olga. I just wanted it to stop and it changed my behaviour. Contrary to popular belief, it’s not the dog’s attitude that will tell you if the training is aversive. It is the dog’s responses. There is a second key difference between these two devices. Shock collars are training. With T.E.N.S., the goal is long-term if not permanent pain elimination. It is not a teaching tool. Olga may have been brutal, but her intent was to offer long-term relief. Magic Hands Mike offered the same goal under threshold. Suzy who does scalp massages at the hair salon….she just gives nice feeling massages. Training cannot be compared to these scenarios. In training, the trainer creates the plan with the goal of creating a change in behaviour. We determine which behaviour we want to teach. Therapies for pain relief have no skills development. Olga never taught me to dance a jig in return for pain relief. She did not use my discomfort as a tool. I never went back to Olga. I had the choice to leave. More importantly, I had a choice to never return. I could refuse to participate. Our dogs do not have that choice during training because repetition is part of the gig. Once the aversive ceases, the aversive is back in play for more training. We can’t see all the differences unless we look at the specifics of how each of these work. If you are ready to jump in and say, “You don’t need batteries to use aversives,” then you won’t get any argument from me. There are many forms of aversives in dog training. Some are easier to swallow than others. You do not need batteries to use aversives. But, let me broaden the statement. 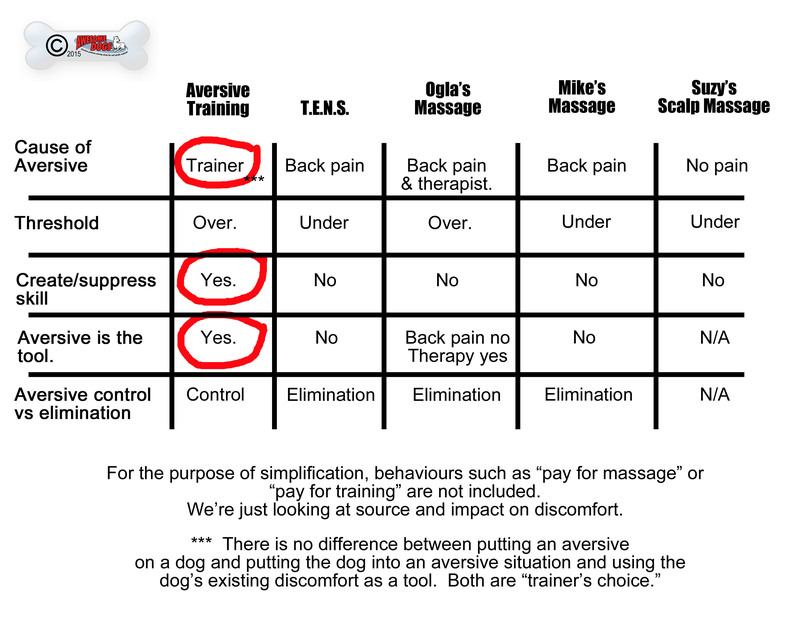 Using aversives in dog training is not the same as using a T.E.N.S. machine. It’s not even close. It does not matter if the aversive is added to the dog, the dog is added to an aversive scenario or whether we use a dog’s discomfort for our training purposes. Using the aversive is trainer’s choice. If the dog is put into a position where they want to leave, they have been put between a rock and a hard place. It’s not free will. The trainer has free will. Training paradigms are not the same as T.E.N.S. machines. In dog training, the choices to use an aversive are ours and ours alone. Previous Previous post: Mama Dogs Don’t Use Treats….. This is an argument i hear a lot; “oh, it’s just like TENS, it doesn’t hurt.” If someone wants to use a shock collar on their dog, know that it causes pain or at least discomfort, and OWN it, and say “I know it hurts and I think it’s worth it because it works for me,” well, fine. Their dog, their choice. It’s when people delude themselves and others into thinking that it’s somehow a neutral thing that doesn’t cause pain to the dog that it really bugs me. If you can’t own up to what you’re doing, and have to tell pretty lies to make yourself and others believe that you’re not actually doing what you’re doing, then maybe you shouldn’t be doing it. So true. I have far more respect for someone who says, ‘yes, this is aversive and I chose to do it.’ I can disagree with that choice, but respect the honesty. I can’t ever respect fluffing, lying, deception. You can always trust a liar to lie. It honestly drives me nuts, the hiding prong collars under prong collar covers so it looks like an ordinary collar, the use of the words “leash pop” and “stimulation” and “correction,” the claims that “it doesn’t hurt it just gets their attention…” it’s just far to much shiftyness for me. If you have to hide what you’re doing, you’re probably doing something wrong. Even if someone doesn’t agree with force free/LIMA/R+/whatever you want to cal it training, at least those kinds of trainers are usually honest about what exactly it is they do. I wish someone would address the “I tried it on myself ” defense . There are so many things wrong about this claim. First, most people don’t try it on their neck. And even when they do, they have control over it and they are able to remove it or stop the shock/prong. A person knows what it is they know what it’s for. Even if they have someone else control the leash or button, it’s not at all in the same context. And anyone who used it on a person the way that it is used on a dog , would be arrested . “It doesn’t hurt the dog”. The entire purpose of these tools is indeed to cause pain and discomfort. If it doesn’t , it won’t work. “It just gets their attention” So does a conditioned word, like a name, with a strong reinforcement history. If your dog isn’t paying attention to you or has no value for you , it may be because your relationship with your dog is trash and it could be trash because you choose to grab a tool , designed to cause pain, to get their attention. Don’t forget human skin is 3 times thicker than dog skin so it’s likely we feel the shock less. This week I saw dog trainer in franchise uniform at busy park teaching client how to use TENS device on her dog for training. Why? Like someone actually decided to buy a Dr. Ho machine and use it? Why? I personally have been subjected to TENS. My daughter also, it seems like we are wired differently. It was like torture to both of us. We are both very High Anxiety people,I would compare us to herding dogs! The intelligent breeds do not need much more than a soft scold, or an eye glance to get them going. Otherwise, heavy scolding will make them reactive.